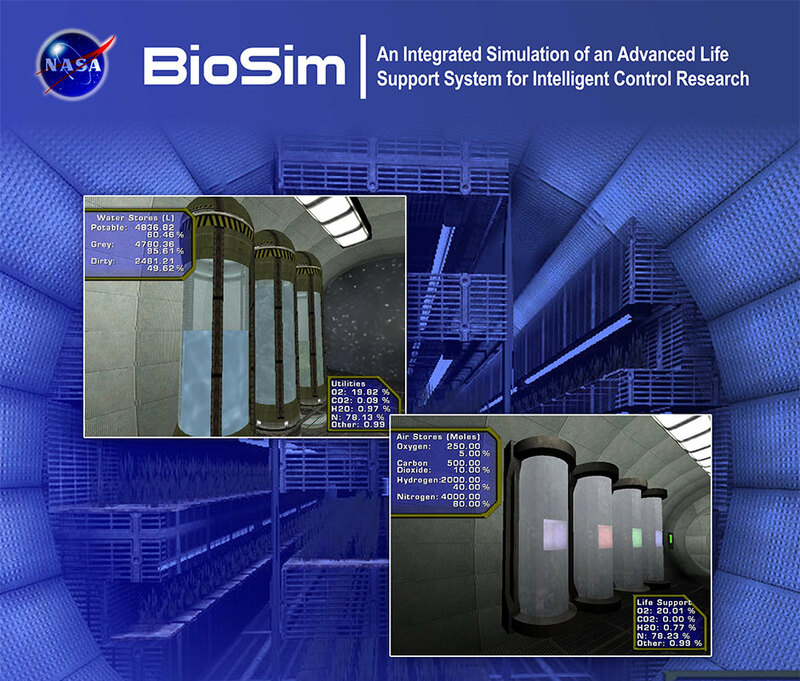 BioSim is a research project being developed at TRACLabs with NASA Johnson Space Center. The objective is to create a portable simulation of a typical integrated advanced life support system in a typical mission scenario with malfunctions and perturbations. It’s been used in projects ranging from machine learning to reliability and mission analysis. Currently the simulation is written entirely in Java for the sake of portability, maintenance, and development. We have tested the simulation on Windows, Linux and Mac platforms. Also provided is a user interface showing the internals of the simulation and a logging facility. Haibei Jiang, Luis F. Rodriguez, Scott Bell, David Kortenkamp “Reconfigurable Control System Design for Future Life Support Systems,” in Proceedings 35th International Conference on Environmental Systems, 08ICES-0192, 2008. Haibei Jiang, Luis F. Rodriguez, Scott Bell, David Kortenkamp, and Francisco Capristan “Prediction of Reliability and Cost for Environmental Control and Life Support Systems,” in AIAA Space 2008 Conference, AIAA-2008-7818, 2008. Haibei Jiang, Kaustubh Bhalerao, Luis F. RodrÃ­guez, Scott Bell, David Kortenkamp, and Alfred Soboyejo “Modeling Stochastic Performance and Random Failure,” in Proceedings 35th International Conference on Environmental Systems, 07ICES-237, 2007. Luis F. RodrÃ­guez, Haibei Jiang, Scott Bell, and David Kortenkamp “Testing Heuristic Tools for Life Support System Analysis,” in Proceedings 35th International Conference on Environmental Systems, 07ICES-240, 2007. Luis Rodriguez, Haibei Jiang, Kirsten Stark, Scott Bell, David Kortenkamp “Validation of Heuristic Techniques for Design of Life Support Systems,” in Proceedings International Joint Conference on Artificial Intelligence (IJCAI), 2007. Luis Rodriguez, Haibei Jiang, Scott Bell, Kirsten Stark and David Kortenkamp, Validation of Heuristic Techniques for Design of Life Support Systems,” in Conference on Systems Engineering Research, 2007. Luis Rodriguez, Scott Bell and David Kortenkamp, Use of Genetic Algorithms and Transient Models for Life Support Systems Analysis,” in AIAA Journal of Spacecraft and Rockets, Vol. 43, No. 6, 2006. Scott Bell, Luis Rodriguez and David Kortenkamp “Using Dynamic Simulations and Automated Decision Tools to Design Lunar Habitats,” in Proceedings 35th International Conference on Environmental Systems, SAE Paper Number 2005-01-2962, 2005. David Kortenkamp, Scott Bell and Luis Rodriguez, “Simulating Lunar Habitats and Activities to Derive System Requirements,” in Proceedings 1st AIAA Space Exploration Conference, 2005. David Kortenkamp and Scott Bell, “Using AI and simulations to design and control space habitats,” poster paper in Proceedings International Joint Conference on Artificial Intelligence (IJCAI), 2005. Gautam Biswas, Pete Bonasso, Sherif Abdelwahed, E.J. Manders, David Kortenkamp, Jian Wu and Scott Bell “Requirements for an Autonomous Control Architecture for Advanced Life Support Systems,” in Proceedings 35th International Conference on Environmental Systems, SAE Paper Number 2005-01-3010, 2005. Nicola Musettola, David Kortenkamp, Chuck Fry and Scott Bell “Planner-Based Control of Advanced Life Support Systems,” in Proceedings 35th International Conference on Environmental Systems, SAE Paper Number 2005-01-2961, 2005. Eric-Jan Manders, Scott Bell, Gautam Biswas and David Kortenkamp “Multi-scale Modeling of Advanced Life Support Systems,” in Proceedings 35th International Conference on Environmental Systems, SAE Paper Number 2005-01-2962, 2005. Theresa Klein, Devika Subramanian, David Kortenkamp and Scott Bell, “Using Reinforcement Learning to Control Life Support Systems,” in Proceedings of the International Conference on Environmental Systems, 2004. David Kortenkamp and Scott Bell, “Simulating advanced life support systems for integrated controls research,” in Proceedings 33rd International Conference on Environmental Systems (ICES), July 2003. David Kortenkamp and Scott Bell, “BioSim: An Integrated Simulation of an Advanced Life Support System for Intelligent Control Research,” in The 7th International Symposium on Artificial Intelligence, Robotics and Automation in Space (i-SAIRAS-03), 2003.